Murray Kuun is a South African luthier who admits he came to the profession relatively late in life, but his passion is in creating fresh designs. 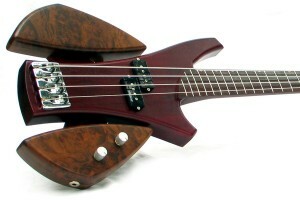 His first bass model is the Elemental, a neck-thru bass with unique body wings. 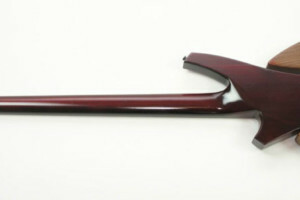 The Elemental is built with African woods including a sapele mahogany body and neck with a figured imbuia fretboard and matching “pods” to fill out the body shape. 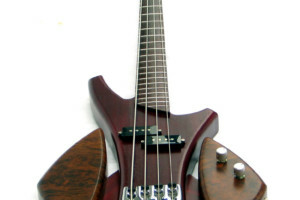 The bass is fitted with a Bare Knuckle split coil pickup with volume and tone knobs nestled in the lower pod. Kuun builds each of his basses by hand, so the Elemental can be ordered with a variety of options for hardware, pickups, and woods. Check out Kuun’s website for more. Marvelous looking bass, reminds me a bit of Spalt Instruments. 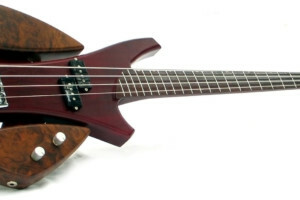 I think I’d like to see it without the wings and with the control knobs relocated to the upper bout. That would look sharp. The bass would probably be top – heavy, though (but when has that stopped us from buying a cool – looking bass?). Definetly cool, but I dont think it would accommodate for my hard and fast live show. Especially not with those wings, they would be gone in the first twenty minutes of the set.